About From The Bunker: Tournaments would come to me for PGA Tour scenes from which they could create posters to promote their event. Here a PGA Tour Pro executes a shot from the bunker. 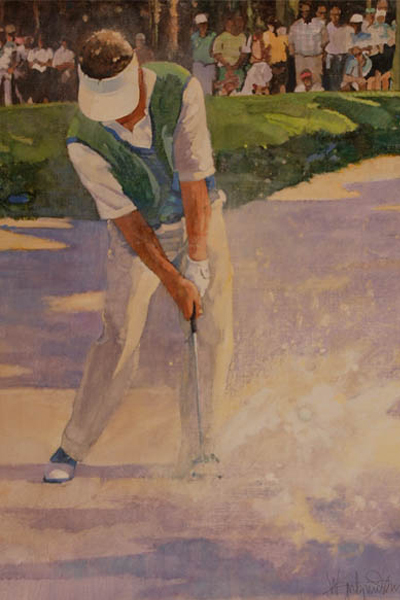 One of a series os three paintings for this purpose, From the Fringe, From the Bunker and Chip Shot. As they are all in the same manner and use of color, they make an ideal tryptic (if you have the room in your den or rec room) or displayed individually as decorative art. Copyright © 2019 Walt Spitzmiller. All Rights Reserved.